The ultimate body tape ! Even repairs damaged breast forms! BodyShape Tape is a very aggressive single-sided medical grade adhesive tape designed to adhere to your body and stay in place. This tape will not snap under pressure. 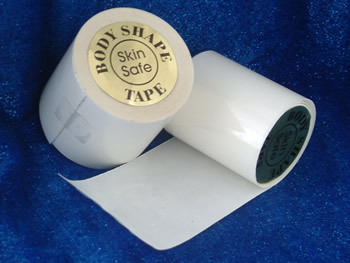 If you have dreamed of a tape that will not let you down, Body Shape Tape is for you. Only ¥1,200 for a versatile adhesive! Stronger, smoother and thinner than Tegaderm yet does not snap under pressure. This single sided medical grade adhesive tape is made with a very strong adhesive that is designed to keep the tape in place under a variety of conditions. Using Body Shape Tape- Cleavage Application is very simple. The protective liner is removed from the tape. About half the length of tape is placed on the area to be lifted. This area is then pulled into position and tape adhered to chest. These steps are repeated for other side of chest. Using Body Shape Tape-Necks and Chins. Tape is applied to each side of neck & pulled back until desired result is reached. Application of tape is best in an area that will be hidden by clothing, hair, or wig, when the tape is drawn back. Using Body Shape Tape- For clothing and repairs. The tape adheres to most materials. When using on plastic, vinyl or leather clothing, check for color fastness first. Removal of Body Shape Tape. Removal is quite simple and painless. A little Baby Oil, or other body oil, is applied to sticky side tape during removal.